Despite the numerous vicious conflicts that scarred the twentieth century, the horrors of the Western Front continue to exercise a particularly strong hold on the modern imagination. The unprecedented scale and mechanization of the war changed forever the way suffering and dying were perceived and challenged notions of what the nations could reasonably expect of their military. Examining experiences of the Western Front, this book looks at the life of a soldier from the moment he marched into battle until he was buried. 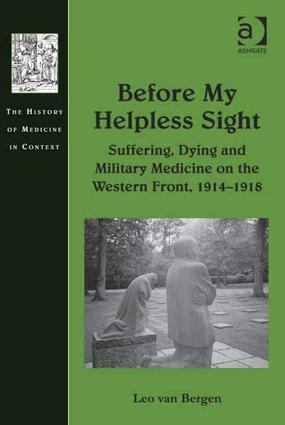 In five chapters - Battle, Body, Mind, Aid, Death - it describes and analyzes the physical and mental hardship of the men who fought on a front that stretched from the Belgian coast to the Swiss border. Beginning with a broad description of the war it then analyzes the medical aid the Tommies, Bonhommes and Frontschweine received - or all too often did not receive - revealing how this aid was often given for military and political rather than humanitarian reasons (getting the men back to the front or munitions factory and trying to spare the state as many war-pensions as possible). It concludes with a chapter on the many ways death presented itself on or around the battlefield, and sets out in detail the problems that arise when more people are killed than can possibly be buried properly. In contrast to most books in the field this study does not focus on one single issue - such as venereal disease, plastic surgery, shell-shock or the military medical service - but takes a broad view on wounds and illnesses across both sides of the conflict. Drawing on British, French, German, Belgian and Dutch sources it shows the consequences of modern warfare on the human individuals caught up in it, and the way it influences our thinking on 'humanitarian' activities. Dr Leo van Bergen is a medical historian working at the Vrije Universiteit Medical Centre in Amsterdam, The Netherlands. His main focus is on the relationship between war and medicine. Dr van Bergen is a member of the editorial board of Medicine, Conflict and Survival.